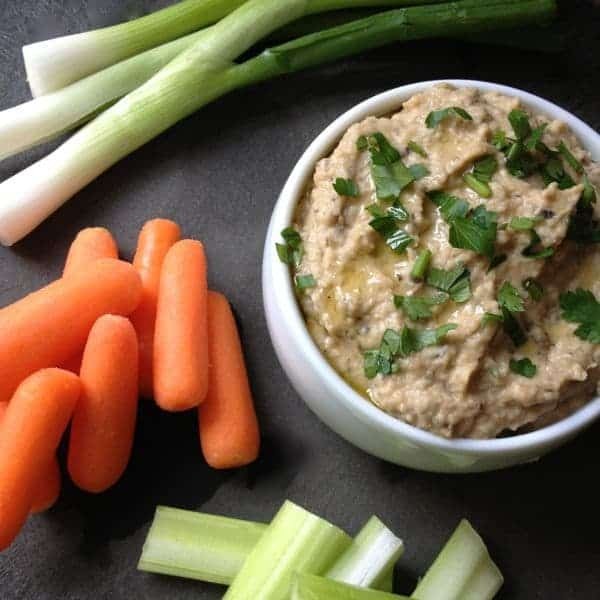 Creamy cannellini beans, caramelized roasted garlic and tangy Greek yogurt are pureed to create this crowd-pleasing Roasted Garlic Bean Dip. Spring entertaining season is in full force here in my house which means we will be having more guests over for dinner parties, hosting more family gatherings and celebrating back to back holidays starting with St. Patrick’s Day and moving on to Easter, Greek Easter and Passover. We don’t miss a reason to celebrate here in our muti-cultural household, that’s for sure. Whenever I host guests, I like to have a light and healthy appetizer ready when they first arrive. The protein in the yogurt and beans combined with the fiber in the veggies and whole grain chips makes this the ideal pre-meal snack. 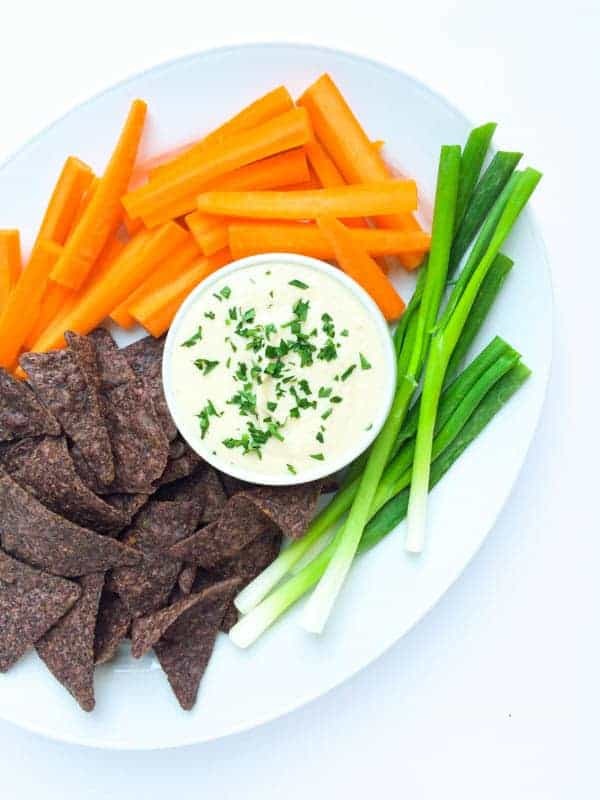 Recently, I had family over for a casual St. Patrick’s Day dinner and wanted an easy make-ahead dip to hold hungry toddlers (and adults!) over until the corned beef was ready. Sweet, caramelized roasted garlic added loads of flavor to the tangy Greek yogurt and creamy cannellini beans. 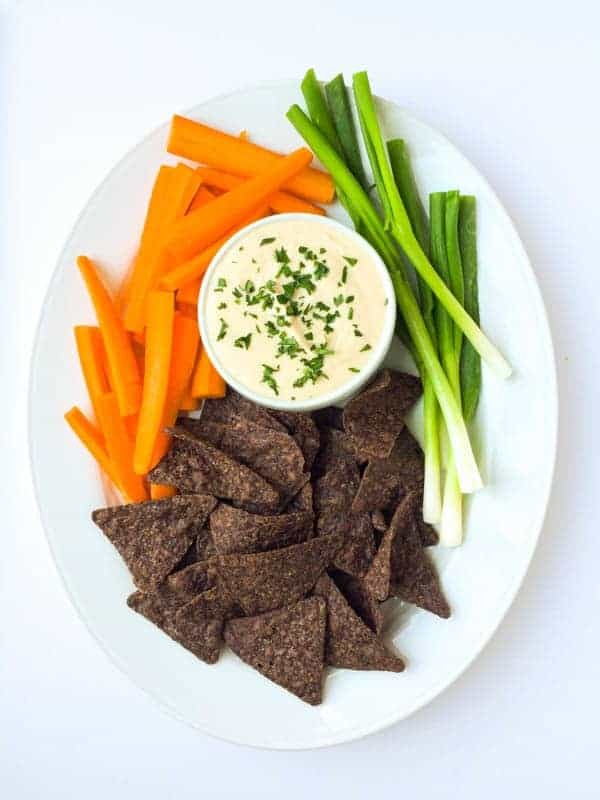 Protein-packed and ready in just minutes, I will be making this dip again and again for snacking or to spread on bread for sandwiches in leui of mayo. 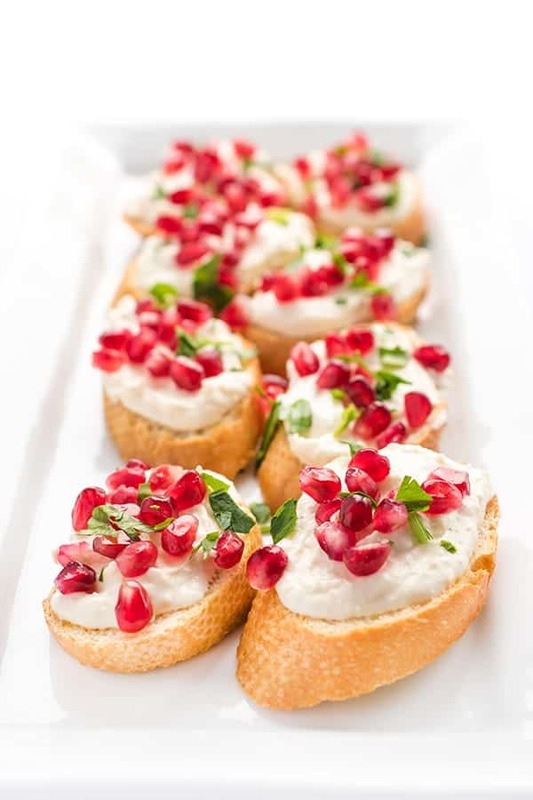 What are your favorite make-ahead appetizers or snacks? I’d love to hear from you. Using a sharp knife, cut off the top of the garlic head to expose all of the cloves then place in the center of a large square of tin foil. Drizzle garlic cloves with 1 tablespoon of the olive oil and sprinkle with 1/4 teaspoon of the salt. Wrap tightly with the foil and place in oven for 40-45 minutes. Remove from oven and set aside to cool slightly. Gently squeeze out caramelized roasted garlic and place directly in a food processor. Add drained beans, yogurt, remaining olive oil, salt, lemon juice and pepper to the food processor and pulse until smooth and creamy. You may need to add a tablespoon or two of water to reach desired consistency. Serve immediately or refrigerate for up to 7 days. Roasted garlic is one of the most magical things on this EARTH. Love this dip! 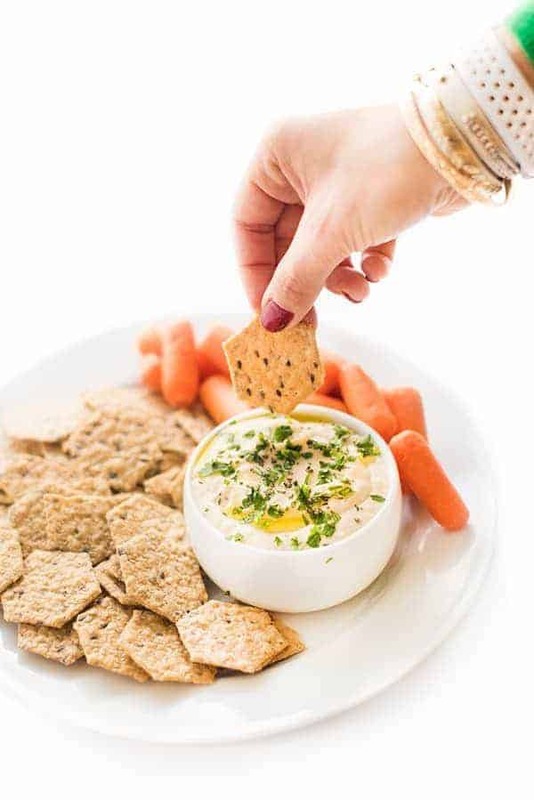 I love that you used Greek yogurt in this dip! It looks so tasty! I’m a Greek yogurt freak! Should have added that I always soak my beans for 24 hours to make them digestible. 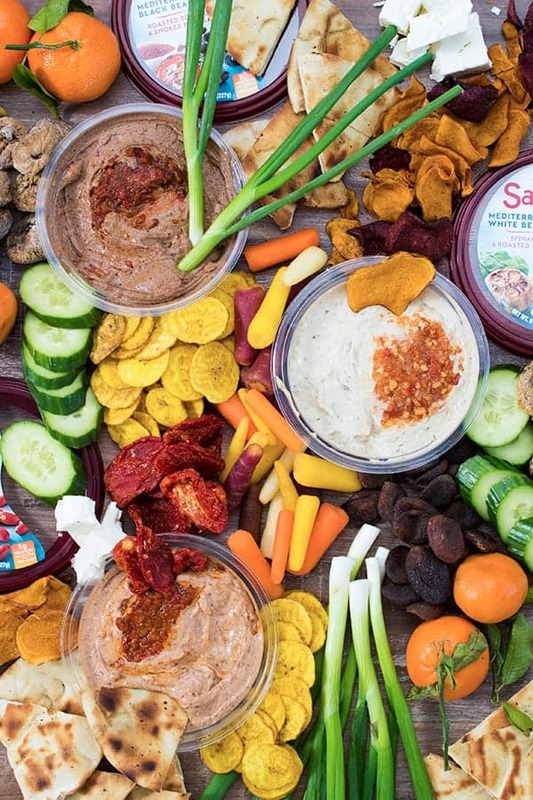 This dip sounds like a great substitute for the ubiquitous hummus. I have a question, though: can one substitute great northern beans, for example? I ask because I just can’t do canned beans – they mess with my digestion too badly. Yep Great Northern are some of my fav! I LOVE that this dip has a whole head of garlic in there! Mmm, I just want to dig in right now! Heck yes! I love garlic! This is what I want for a snack right now! Delicious!!! Love a good bean dip! Love this dip! I like to layer puff pastry, muenster cheese, ham, dijon mustard and top it with another layer of puff pastry. Seal and crimp the edges and bake until crispy! Everyone always loves that one. Ok that sounds out of this world!! Wow this look soooo delicious and I love how healthy it is! Definitely adding to my must-make list! Roasted garlic is the bee’s knees and what a fun way to use it. So glad to see raw green onions on somebody else’s appetizer platter! I grew up eating green onions with dip, but I have onion-adverse friends who think it is incredibly strange. Whatever! Love the double protein punch of yogurt and beans in this recipe! YES!! We grew up eating them on platters too!!! I love that!! Yummy!! That sounds so good! I love the roasted garlic in this dip! Any bean dip works for me :) Gorgeous appy! I want to be like you when I grow up. I want to be that wonderfully sophisticated host that serves this for my guests at dinner parties but in the meantime I might just make this for myself! Yummy! This looks so good my kids probably wouldn’t even realize it’s good for them! We go with hummus, or guacamole for the quick snack. Love this, Liz. We eat so many beans in our home and I love making fresh dips! Don’t mind me as I dive right into this dip! I can’t resist a good dip! Ooh, I love how quick and easy this is to whip up once you roast the garlic. Yum! I was so pleasantly surprised the first time I had a beans in a dip, that now I make bean dips all the time! this one sounds amazing! This sounds so good Liz! I love that you’ve amped up the protein with both beans and yogurt – I bet the texture is unbelievable! I’m moving this upcoming weekend and on Saturday, we had a leaving party for me with a bunch of friends. I made tons of dips using the beans I had leftover in the pantry, including a chipotle black bean dip, simple hummus, and ginger peanut sauce (which had a few leftover chickpeas in it). They’re so easy to blend up ahead of time and we just served them with a bunch of veggies and crackers. None of them however, contained roasted garlic, and now you’ve got me DYING to give it a try! Oh my gosh I want to come to your party!!! 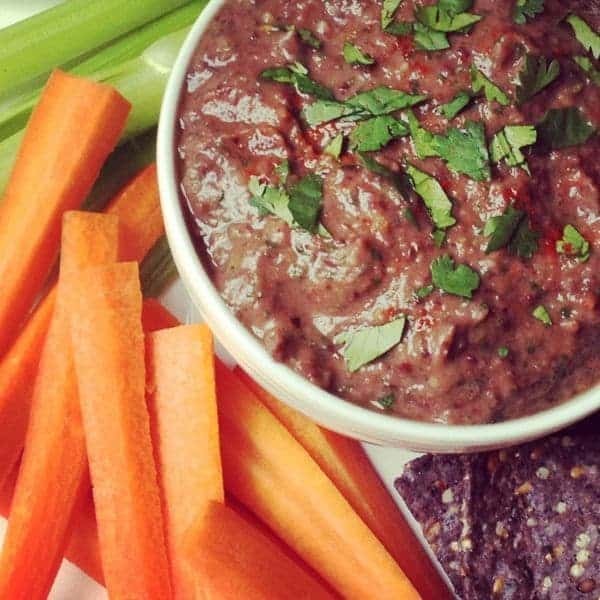 I’m a major fan of any bean dip that doesn’t include tahini — this one looks fab! I knew you’d like this one!! My kids devoured it!! YES!! I love hummus but it’s nice to change things up!